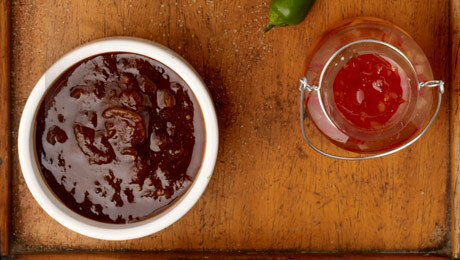 Chicken, Beef or Ribs – everything tastes even more delicious slathered in this Homemade Barbecue Sauce. You can vary the spices and add some dried chilli if you like it HOT! Add the onion and garlic and cook until softened then pour in the tin of tomatoes. Add the paprika and ginger, and cook for a further 2 – 3 minutes. Stir in the mustard, Worcestershire sauce, tomato sauce, soy sauce, vinegar, treacle and sugar then cook until reduced and thickened, add some water if necessary. Pour into sterilised jar and secure lids. Store up to 1 month in the fridge.